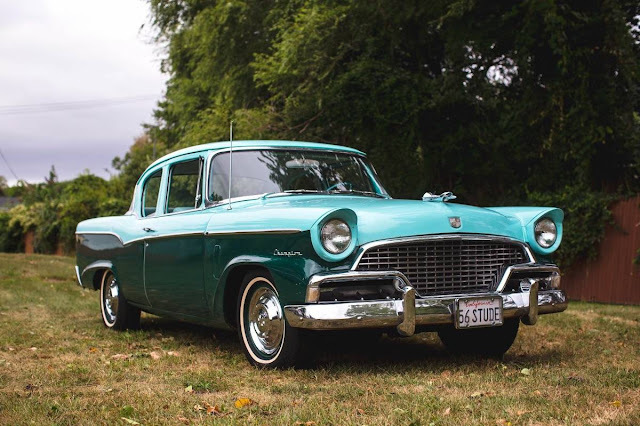 Are you a fan of 1950's American cars? Do you like the styling of the 1957 Chevy, but can't afford the cost of entry? Do you fancy the colors aqua and teal used together? Do like your chrome bumpers to be really ornate and made of real metal? 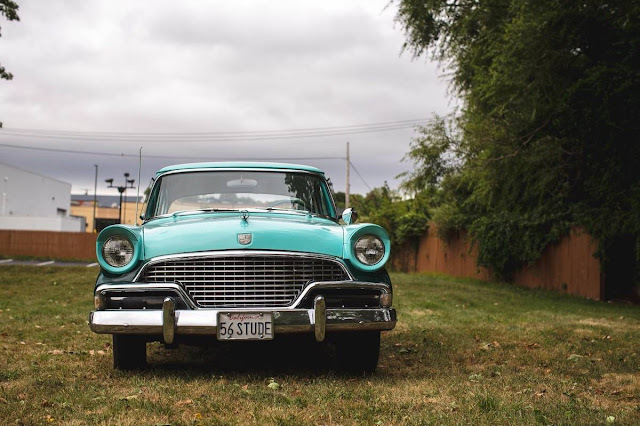 Studebaker is an American automaker that not many people under the age of 50 are too aware of these days as they built their last new car in 1964. Find this 1956 Studebaker Champion coupe for sale in Guilford, CT for $8,500 via craigslist. 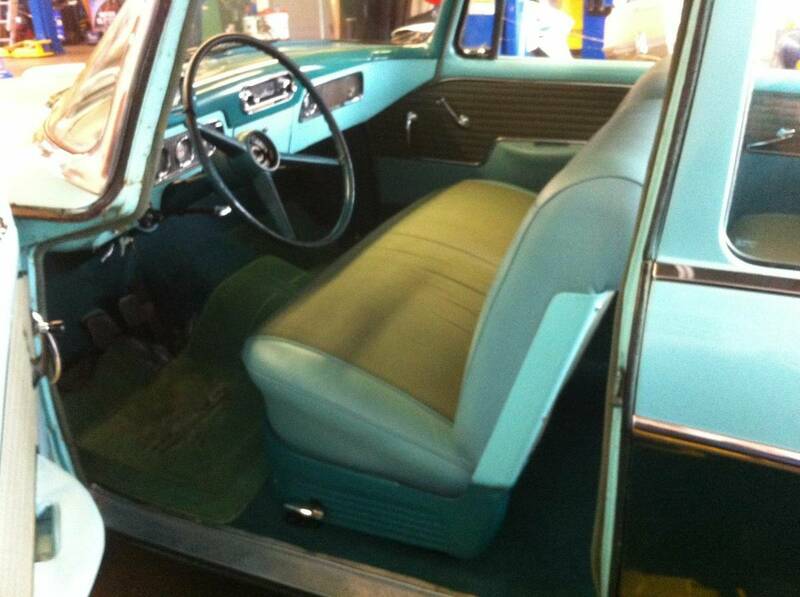 The seller describes his 56 Stude as a super sweet ride that you don't see many of around. 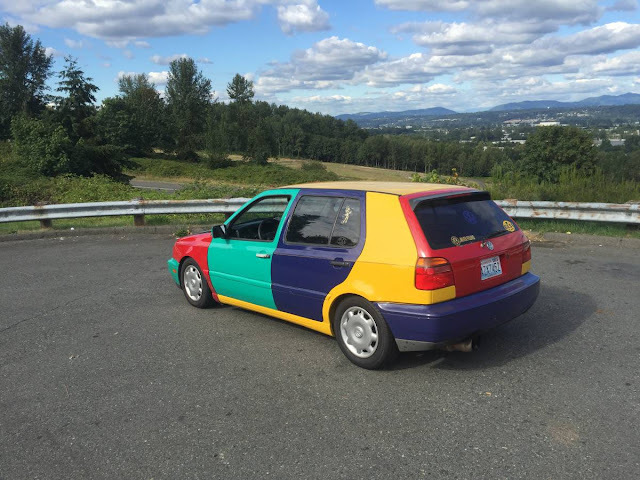 The car was originally from California and only shows 57,000 miles. It's 101 hp flat head 6 cylinder engine is mated to a 3 speed manual column shift with a overdrive/cruising gear. The interior and headliner were recently refreshed and came out great. The front bench seats are as flat as Kansas so any hard cornering is going to send you across the aisle. The two front windows have cracks, but still function as is. The fourth generation champion model came in a dizzying array of body styles which included: 2 door coupe, 2 door convertible, 2 door wagon, 2 door sedan (what is this? ), 4 door sedan, and 4 door wagon. A fifth generation Champion was new for 1957 and only soldiered on until 1958. Cory is making slow progress on his 1995 Mercedes C36 AMG project and hopefully picking up a dirt cheap 1986 Mercedes 300e 5 speed this week. Unfortunately they never offered a hardtop version. The V-8 in the Commander is the better motor, but there are suppliers for speed equipment for the 6, also aftermarket front disk brake kits, and a few other items to make this a fun weekend ride. Certainly a much cheaper way to get into a well kept shoebox style 50's cruiser than finding a rusting overpriced tri-five chevy. The 1955 Studebaker Champ was much more streamlined looking. This, unfortunately shows what happens when a forward thinking company eschews their real talent for building distinct looking cars and succumbs to the pressures of the public's thirst for big upright grills, which were the penchant of the Big 3 in the late 1950s. I wonder how many at Studebaker suspected they wouldn't be building cars 10 years later, even though they would come with a wonderfully sized Lark, and the avant garde Avanti and incredibly practical Wagonaire? Can I just ask who started putting acid in Acura's water? Their designs have been...unique over the past decade. aka the Batman Joker Smile Grill? I like Studebakers. But I'm probably a little weird and we had one rotting away in our garage when I was a kid.